In a J.D. Power study that looks at which cars have the fewest problems over the first three years, Lexus is number one. There are many ways to quantify reliability, durability, and quality. One of those ways is to do surveys of owners of vehicles after three years of ownership and tally up the number of reported problems. That is what J.D. 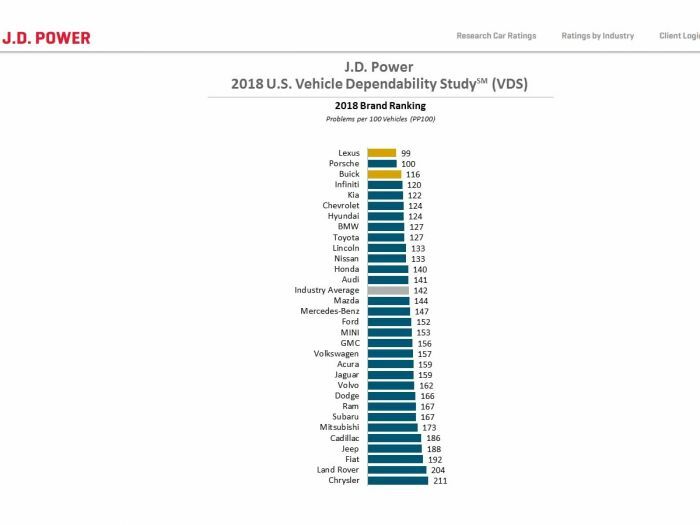 Power does in its annual Vehicle Dependability Study (VDS). After the smoke had cleared following this year’s study, Lexus was found to be the most dependable brand. Sound familiar? Lexus and Toyota have earned the top spot on so many of these types of stories they all seem to run together. However, Kia and Hyundai are now often beating Lexus and Toyota on studies of quality and durability. Lexus edged out super-low-volume specialty-builder Porsche this year by just a single point. Then there is a pretty good gap until GM’s import brand, Buick shows up. Then Infiniti, Kia, Chevrolet, and Hyundai appear before Toyota. Cadillac has about double the number of reported problems that Lexus does. All of the FCA brands finish in the bottom of the list along with Land Rover, Mitsubishi, and Subaru. Subaru’s low scores on this ranking may be due in part to the excessive oil consumption issue that has struck so many Subaru owners. Although this new study is just one way to look at quality, Lexus and Toyota have scored well on studies of everything from the best older used cars to best for resale value to which vehicles are the most worry-free.